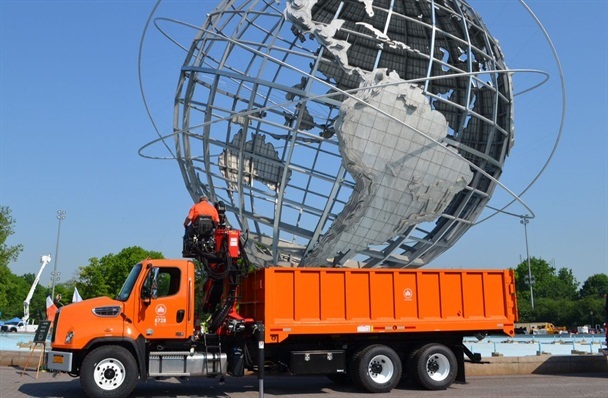 A Parks Department forestry log loader is pictured here in front of the Unisphere in Queens, New York. Photo courtesy of New York City. Expanding use of a fuel management system to all fueling sites and vehicles. With nearly 27,000 units, the New York City fleet is the largest municipal fleet in the country. It’s one of the most visible and services the most populous city in America. However, decentralization was causing inefficiencies and duplicate work, and staffers saw a potential for huge savings in sharing services. While this had been talked about for years, it wasn’t until late 2011 that the ball got rolling to make some changes. Keith Kerman, previously overseeing fleet in the Parks Department, was appointed the Department of Citywide Administrative Services’ (DCAS) chief fleet officer in 2011, a new position created to oversee the service sharing program and implement other fleet initiatives. An executive order in early 2012 solidified the goals. Some of the goals DCAS tried to meet were to optimize the operation, better track operations, reduce costs, and improve fleet sustainability, Kerman said. The fleet departments formed an interagency working group and in the next two years, members worked on numerous fleet changes that would improve efficiency and reduce costs, including a new vehicle auction system, a new fleet management system, light-vehicle fleet reduction and creation of motor pools, and the consolidation of maintenance facilities. The final result of these and other changes is an estimated $415 million in savings and cost avoidance from FY-2012 to FY-2016. How did New York City achieve this savings? Kerman explains how the team did it, how much it saved, and what he believes are the most successful aspects of the savings and efficiency program. One of the biggest assets to the program was the formation of what staff members call the Fleet Federation, which consists of the 10 largest department fleets that meet every two weeks. These fleets control about 24,500 of the city’s vehicles (about 91%), have their own maintenance facilities and fleet managers, and mostly worked in isolation. The major fleet agencies are: Police, Fire, Sanitation, Transportation, Environmental Protection, Parks & Recreation, Correction, Education, Health, and DCAS. DCAS supports these fleets in areas such as acquisitions, fueling, sustainability, service contracts, and parts, but it doesn’t oversee their maintenance facilities. The other 40 agencies with small fleets rely more heavily on DCAS for fleet management, including maintenance, fueling, and vehicle tracking. The Fleet Federation consists of representatives from the 10 departments with the largest fleets in the city, representing 24,500 vehicles. The group meets regularly and was a main driving factor in the success of the city’s savings initiatives. Photo courtesy of New York City. “The overarching theme was to ensure best practices that were happening in certain parts of the city were duplicated and run city-wide,” Kerman said. This is in addition to shared services among departments with fleets. One example of duplicating successful practices was with the use of biodiesel, which only the Sanitation and Parks & Recreation departments were using in significant amounts. “If biodiesel is an important project for our environmental goals and it’s successful for agencies like Parks and Sanitation, is there any reason we aren’t doing this everywhere?” Kerman said. Now all fleet vehicles use B-20 biodiesel when possible, while emergency vehicles use B-5. This change allowed the city to run a “greener” fleet, helping accomplish one of its goals of reducing petroleum fuel consumption. The fleets paid for this biodiesel switch, and even saved 50 cents per gallon, by switching from more expensive D1 winter diesel fuel to D2 for its biodiesel blend. Kerman said this blend had been tested and was in use successfully for years by the Parks and Sanitation departments. In September 2013, city officials passed a law requiring the use of biodiesel in fleet vehicles, codifying a practice that was already taking place. Another example of expanding a successful program is the widespread implementation of EJ Ward’s CANceiver fuel management and vehicle data system. The Parks and Police departments were already using automated fuel tracking, and DCAS is looking to expand this to all 200 general use fueling sites and on every vehicle by the end of this year. “We think we’re going to have enormous capacity as Parks and Police has to better study fuel use, to better optimize deployment of vehicles,” Kerman said. With the system, fleet staff will be able to determine deployment of hybrid and electric vehicles depending on utilization and study driver behavior such as speeding, acceleration, and idling. These safety items are critical as the fleet implements a new plan to reduce pedestrian fatalities. The increased efficiencies and fuel cost reductions are expected to offset the cost of the system. As part of the facility consolidation, the Department of Sanitation is maintaining and repairing Health Department vehicles. Photo courtesy of New York City. As for shared services, a potential area to look into was maintenance. The Fleet Federation fleets had 47 dedicated facilities, including the city auction site. They all serviced only their own vehicles but began looking into whether and where shared services would work. The fleets eventually reduced their maintenance facilities to 37, shuffling the maintenance and repair duties of closed garages to other nearby facilities. This means some Fleet Federation departments no longer handle their own maintenance, but outsource it to another city department. The Police Department, which has the largest light-duty fleet, now maintains 1,700 vehicles for the Department of Transportation (DOT) and the Department of Environmental Protection (DEP). The Sanitation Department now maintains 1,000 heavy-duty vehicles for the DEP, Parks, Education, and Health departments. The Parks Department maintains 200 DEP vehicles. The DOT does heavy-­duty towing for a number of agencies. Of the 10 facilities DCAS shut down, eight were repurposed for other use. That meant for example, that a Parks facility could be used for Parks operations rather than as a garage and maintenance facility. One building was sold, allowing the city to avoid a significant capital expense. An old fire department facility was scheduled for a $170 million rebuild, and by transferring maintenance of those fire units to another facility, the city saved that much on capital costs and brought in more than $12 million in revenue from the sale. 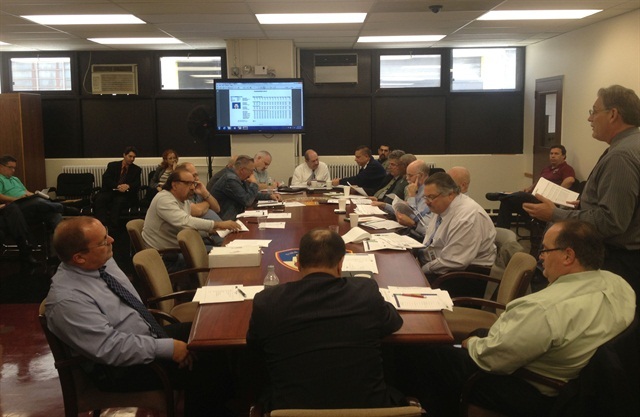 Fleet staff have also worked on procurement consolidation initiatives. Kerman said where in the past, every department would write its own specs and put out its own bids, essentially duplicating work, the fleets now have formed a shared specs committee that works together to specify vehicles. This group allows the fleets to put out one bid, and higher volume contracting allows for lower prices and standardized maintenance. In addition to sharing services and expanding successful programs, the fleets implemented other cost-savings measures that include outsourcing vehicle auctions and significant investments in technology. The city for years had conducted in-house auctions at the Brooklyn Naval Yard that few people knew about, and Kerman said the vehicles took up six acres of prime space. In April 2012, the DCAS announced a partnership with Property Room, an online auction site. Because the company partners with Copart, vehicles are now sent to Copart lots for online auction, allowing DCAS to return the six acres to the Brooklyn Naval Yard to use for economic and revenue development, Kerman said. “We got out of the business of having to store and park and tow these cars…we went to an online auction so anybody in America with a computer can bid on our vehicles, and we’ve increased revenue,” he said. The city has auctioned 3,500 vehicles since 2012, and Kerman estimated a 25% increase in revenue using the new method. It also reduced workload for employees, since their involvement in auctions is now limited to managing the contract. Another initiative was to reduce the city’s non-emergency light-duty vehicles, of which there were about 5,000. Of these, the city reduced 475 vehicles. To do this, the city partnered with Zipcar to make general Zipcar car sharing vehicles available to all employees, reducing their dependence on fleet vehicles while improving mobility. Then, it installed Zipcar’s FastFleet technology on 580 city-owned agency vehicles to allow for motor pool use. Each of the four main departments using this program — Parks, DEP, Health, and DCAS — have their own motor pools. Kerman explained that since the department offices are located in different boroughs and are spread out, it made sense to keep each department motor pool separate. “We’ve self-funded this project through the reduction of light-­duty vehicles, and that has worked well,” he added. A major investment was the purchase of a fleet management information system, AssetWorks FleetFocus, to replace a much older fleet system used separately by the departments. Kerman expects the new networked system will help facilitate the shared maintenance services and reduce operating costs. While the city has reduced its light-duty non-emergency fleet, it hasn’t reduced its specialty or emergency vehicles. 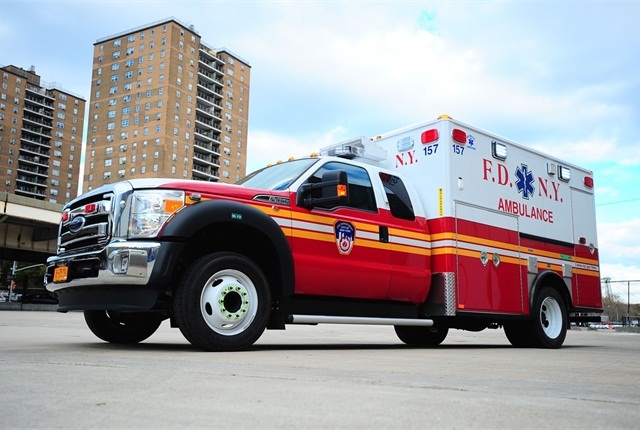 Pictured is a new Fire Department ambulance. Photo courtesy of New York City. Making big changes, especially for large agencies such as New York City, always comes with challenges. One challenge might be in employee displacement — with the closing of 10 facilities, DCAS worked with unions to move the employees to other positions. Kerman explained that there were no staff reductions. About 100 employees were transferred to other agencies, and another 100 were transferred to different maintenance facilities within the same agency. In fact, the fleets actually hired more staff, focusing on entry-level positions to allow for movement up the ranks. “Like many government agencies, we’ve seen a lot of retirements in our mechanic specialists, and we’ve been working to build a new team of city specialists,” Kerman said. 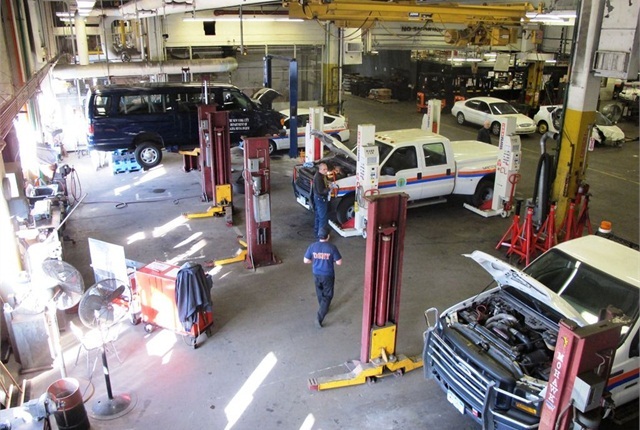 The maintenance facility consolidation led to a change that was difficult for some technicians and supervisors: servicing and prioritizing other departments’ vehicles, something they haven’t historically done. Also, dealing with daily operations while working on the multi-year project has affected all the fleets. “It’s been a challenge for all the agencies, and they deserve a lot of credit for this,” Kerman said. These changes, however, will result in increased efficiencies and potentially less work. As with many large projects, buy-in is essential to implement large changes in any organization. Kerman said the biggest key to the success of the savings program is the Fleet Federation. After the success of its first project, the Fleet Federation is moving forward with a new project. On Feb. 18, New York’s new mayor Bill de Blasio released a Vision Zero Action Plan to reduce traffic-related deaths on city streets. As part of this goal, DCAS will ensure that all fleet vehicles will be equipped with telematics to record potentially dangerous driving activity by the end of 2014. The department will also upgrade the collision tracking system, oversee defensive driver training courses for all city drivers, and look into safety devices for city vehicles. The fleets have already started their telematics program (through the fuel management system) and are in the process of developing a collision management model to collectively track collisions. For these goals and the rest, Kerman believes the Fleet Federation will be critical to ensuring their success.